To those in the U.S. who read this blog - few though you be - I wish you a Happy Thanksgiving! And to those from elsewhere around the world, I wish that you also may have times of profound thanks, even in times of severe suffering and pain, or perhaps in spite of so much that is wrong. I'll be back on the other side of the holiday. Peace. Now it's the mesembs turn to flower. This is Gibbaeum dispar, one of my favorites. More good weather out there so I couldn't resist taking some more photos. 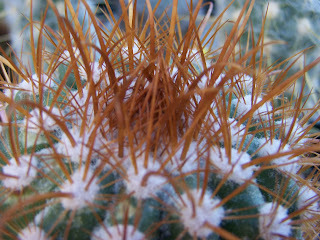 These are the spines of an old plant of Parodia maasii. Regardless of its less than clear parentage, we came to really like the little babies! I understand a few are available for adoption over at the nursery. The Echeveria 'Perle von Nurnberg's are looking so nice at this time of year. The colors are just fantastic! Lynn-Marie took this photo a couple of weeks ago on the way to the Oregon Coast. 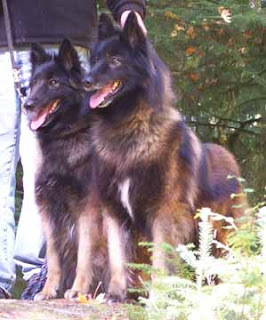 These are our two Belgian Tervurens, Osita (daughter) and Kiani (mother). They send you their greetings. I've really come to like this little South African plant. And when it flowers - wow - does it have a scent. Haworthia retusa (seed from EA1208). Some very nice seed grown haworthias are coming into their own in the greenhouse.